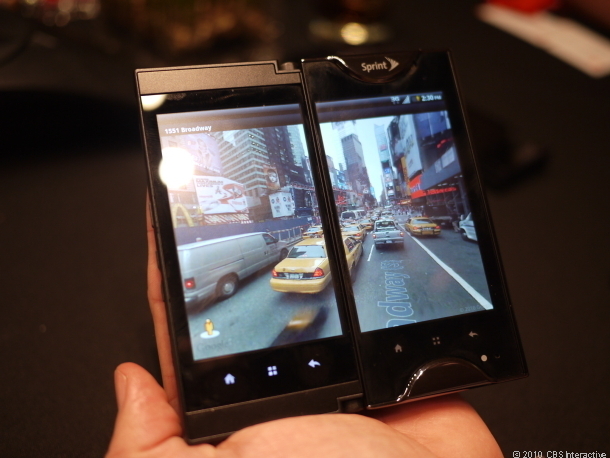 After weeks of teasing an "industry first," Sprint finally took the wraps off its secret project and unveiled the Kyocera Echo, the first dual touch-screen smartphone, at a special event in New York today. Available later this spring for $199.99 with a two-year contract, the Kyocera Echo boasts two 3.5-inch WVGA touch screens and a "pivot hinge" that allows you to place the two displays side by side to form a larger 4.7-inch display. In development for more than a year and a half (even longer for the hardware), the Echo runs Android 2.2 and features software that is optimized to take advantage of the two screens. There are actually four modes in which you can use the Android 2.2 device: standard, tablet, optimized, and simultasking. In standard mode, you can use the Echo as a traditional touch-screen smartphone. The pivot hinge allows you to tuck the second display under the first, so you can navigate and operate the handset like many of today's latest devices. Meanwhile, tablet mode lets you view and interact with an app on both screens. The optimized and simultask modes are a little more advanced in their capabilities. The former supports a single app and gives you the main view on one screen, and the app's complementary features and functionality on the second screen. For example, if you're checking e-mail, you'll get a view of your full inbox on one side of the screen, and the second will give display the full text of a selected message. Another example is the photo gallery. You can get a full view of a photo on the top screen and a thumbnail photo gallery on the bottom. However, the simultask mode is where the Echo's true attraction might lie. In this mode, you'll be able to take multitasking to a new level as you'll be able to use two apps concurrently with each displayed on one of the dual touch screens. At launch, there will only be seven main apps that will support simultask mode--browser, contacts, e-mail, messaging, gallery, phone, and VueQue (YouTube app that lets you view video on the top screen and lists related clips below). Each will be marked with a small blue-gray box to indicate simultask support. Once you select one of those apps, you can tap both screens to select a second app to display on the other screen. There's an onscreen function that will allow you to easily swap the tasks as well. When we first heard reports of the Kyocera Echo this morning, we weren't sure what to expect but we can definitely say we were impressed by what we saw during our meeting with Sprint and Kyocera earlier in the day, but of course, there are concerns. For one, what is the battery life going to be with two touch screens? The Echo ships with a 1,370mAh lithium ion battery with a rated talk time of 5 hours and Sprint says it's been testing on par or better than other smartphones. However, Sprint is including a second battery along with a charging case in the box, so you can easily swap out the battery. The second concern we had was how smooth the navigation would be between the two screens. Both Sprint and Kyocera realized that minimizing the seam between both displays was a key factor in creating a good user experience, so they did their best to make that happen. We can say it was certainly better than what we expected, but there is still a break in fluidity with some tasks, such as navigating a Web site. We only had a few minutes with the device, however, so perhaps this is something we could grow accustomed to with more time. Other features of the Kyocera Echo of note include a 1GHz Snapdragon processor, a 5-megapixel camera with 720p HD video recording, mobile hot-spot capabilities (up to five devices), and 1GB internal memory and preinstalled 8GB microSD card. As noted earlier, the Echo is running Android 2.2, but there is no custom user interface. One omission that might disappoint some is the lack of 4G support. However, Sprint said in order to keep costs down and in order to bring the smartphone to market sooner rather than later, there was a bit of trade off. We've got more coverage coming on the Kyocera Echo, including a First Look video, so keep it dialed in here for more but in the meantime, check out our hands-on photo gallery below and definitely be sure share your thoughts on the Echo with us below. We're really curious to hear what you think about the device.